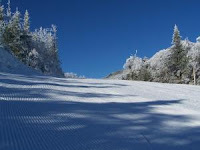 Whiteface Mountain, in Wilmington, New York, was recently named the 4th most popular ski resort in North America by Conde Nast magazine. I was pleasantly surprised to hear this news. As you may have noticed, I am a big fan of the Adirondacks. And even after living here for 20 years, I still feel like I am on holiday. However, the rating surprised even me. There are no Vermont ski resorts even close to Whiteface in the ranking - and the list was for all of North America. It seems the Adirondacks have been discovered as a resort destination. The word from the tourism folks is that town is completely full and booked for this holiday week!